Because a character that occupies our hearts should also inhabit our game worlds. 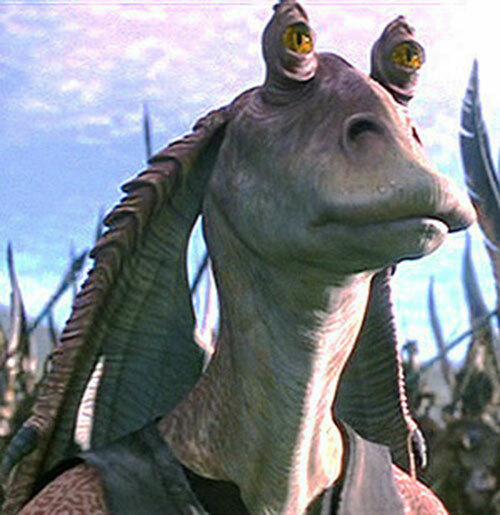 Jar-Jar Binks was one of the characters in the Star Wars prequel trilogy – the three movies released from 1999 to 2005. Supposedly intended as comic relief, he was less than positively received for more than a few reasons. Whether he replaces the 1978 Star Wars Holiday Special as the lowest point of the franchise is debatable. Base Of Operations: Coruscant, formerly Naboo. Height: 6’6”	Weight: 150 lbs. Being a Gungan, Jar-Jar is amphibious (in DC Heroes RPG terms, Sealed Systems), with powerful legs (Jumping, Swimming) and a skeleton composed mostly of cartilage (Skin Armor). 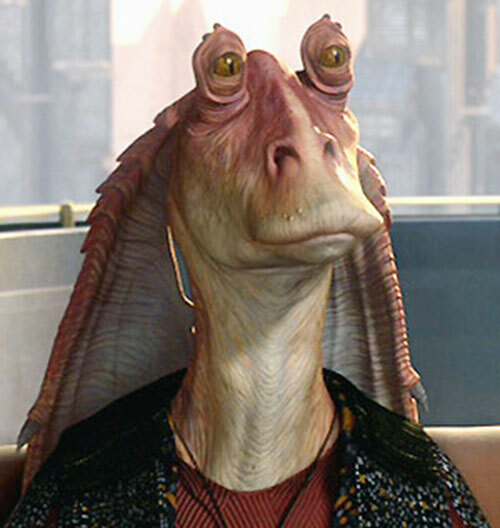 Jar-Jar is unusually clumsy for a Gungan and has been responsible for numerous accidents (Unluck). 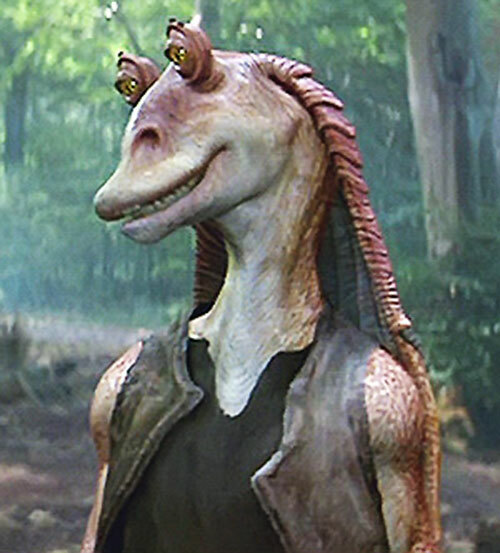 Despite being relatively uncoordinated, Jar-Jar has always managed to avoid serious injury and has even made inadvertent contributions in several critical situations (Dumb Luck). 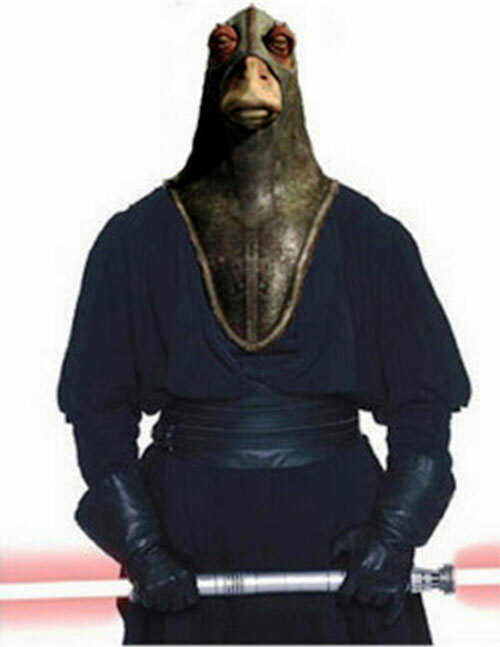 Jar-Jar Binks is a Gungan, a race of gangly amphibious humanoids with vaguely duck-billed faces, yellow eyes on stalks, and large ear flaps. Jar-Jar has mottled orange skin and a sort of stilted walk like a giraffe’s. During his time in exile he wore only his homespun clothing. After he became a Senatorial Representative, he wore elaborate robes in earth tones that complimented his natural coloration. Jar-Jar lives a life of loud desperation, seeking only to make himself useful and unfortunately repeatedly causing accidents. He means well, though, and is usually an enthusiastic and gregarious individual. By the time of his senatorial appointment he has calmed down somewhat, but still gets excited fairly easily. 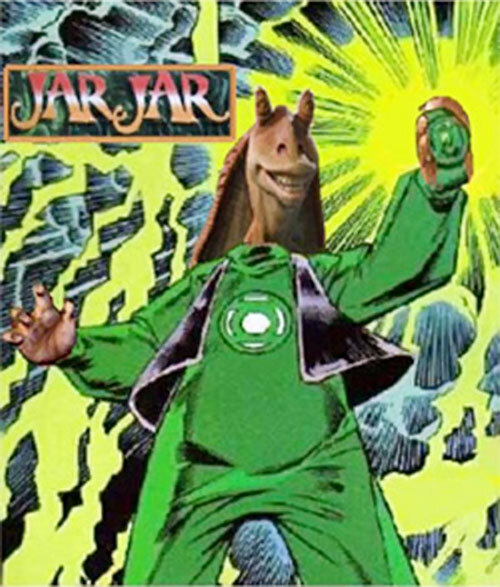 Jar-Jar hooked up with Kyle Rayner on Rayner’s trip through the various dimensions seeking the Worligog during the JLA “Rock of Ages” storyline. Jar-Jar accompanied Kyle back to the Earth Dimension and is now a sort of JLA sidekick à la Snapper Carr during the JLA’s early years. 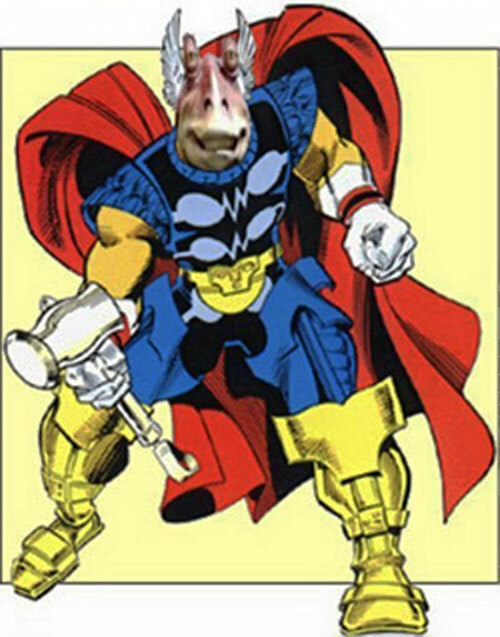 If you want to make Jar-Jar a native of DCU Earth, the Gungans could be an offshoot of the Poseidons. They built their city of Otoh Gunga closer to shore after additional changes in their biology rendered them amphibious. Jar-Jar might be acquainted with the Swamp Thing, having met him in the swamp during Binks’s exile from Otoh Gunga. Jar-Jar’s exile was interrupted by the Invasion , during which he assisted Aquaman in battle against the Gil’dishpan. Indeed, the arrival of the Grand Gungan Army, summoned by Jar-Jar, helps turn the tide of battle. Sealed Systems only allows Jar-Jar to hold his breath (-2FC). Area Knowledge (Otoh Gunga — the underwater city), Government Credentials (Galactic Senate Representative, Medium), Military Credentials (General in Gungan Militia, High), Popularity (Local Hero — Naboo). “Booma” (Boomer) (x3) [BODY 01, Lightning: 06 (No Range), Grenade Drawback. The boomers are small orbs that carry an electric-blue energy plasm inside; the orbs shatter when they strike a target, releasing the plasm and delivering an electric shock. They are usually thrown with slings, adding 1 AP to their thrown range (in Jar-Jar’s case, going from a 2 AP Range to 3 APs)]. Kaadu: Scaly wingless avians with strong legs used as cavalry mounts in the Gungan army —just use horse stats. 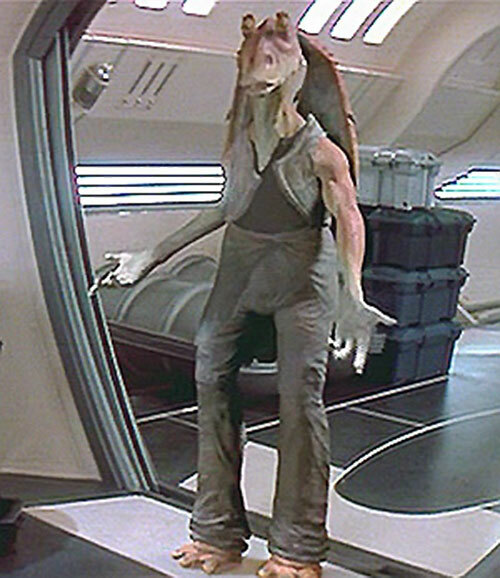 Previous to his adventures during The Phantom Menace Jar-Jar had Exile (Involuntary), Socially Inept, and lacked any Connections, Credentials and Popularity. He also only had Resources: 001. 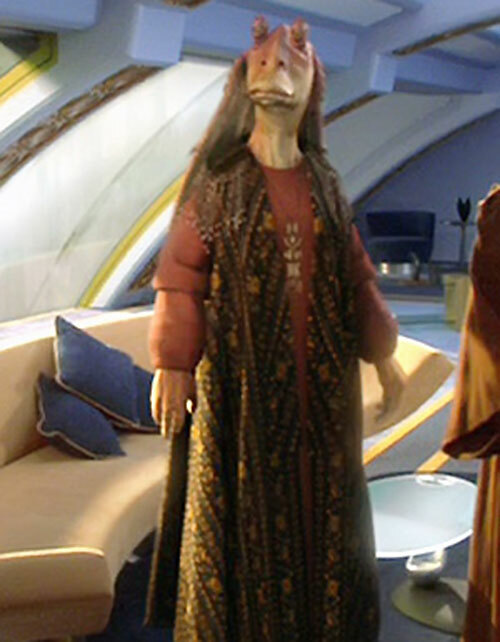 After The Phantom Menace, Jar-Jar Bought off Exile and raised his Resources to 003, but still lacked his Government Credentials. 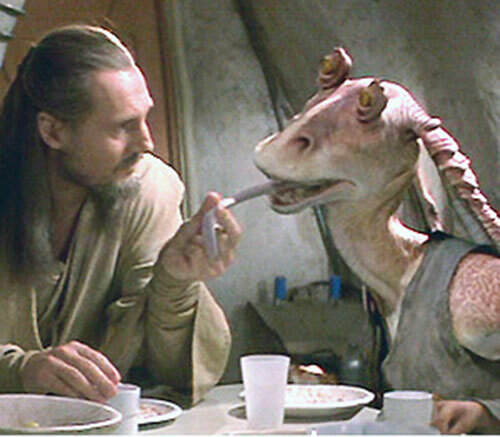 Between then and joining Senator Amidala’s entourage, Jar-Jar bought off Socially Inept. 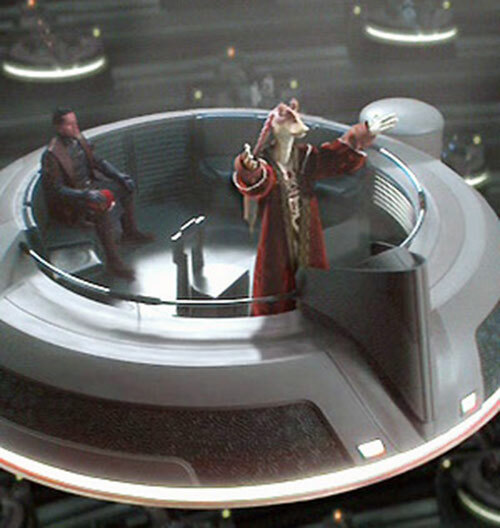 Upon becoming a Representative to the Galactic Senate, Jar-Jar finally gained his Government Credentials and reached the status shown above. Leaked details from the Episode III script indicate that Count Dooku/Darth Tyrranis is only a pawn. The true apprentice of Palpatine is Jar-Jar Binks, a.k.a. Darth Dread, who will engage in a full-scale slaughter of the hapless Jedi in the next movie. His simpleton guise masks a Machiavellian intellect and his clumsiness belies his brutally efficient economy of motion in combat. To model Darth Dread Revealed, add 07 APs to all Attributes except STR and BODY, which only get 02 more APs each. Boost HPs to 150 and Resources to 028. Add Acrobatics, Military Science, Martial Artist, Thief, Vehicles, and Weaponry Skills (all Linked), Occultist (Force): 14 and all Force Rituals (All Memorized). Add Quote: “Meesa gonna quench the heat of my blade in the blood of yousa entrails! Bwah-ha-ha-ha-ha!” and give him a sithsaber. (Yes, it’s a joke. Relax). 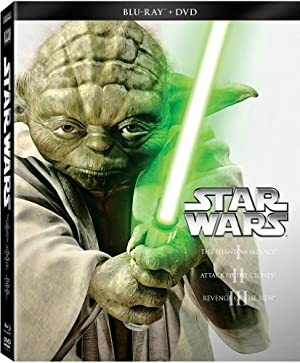 Source of Character: Star Wars Episodes I & II (movies). Helper(s): David Johnston, Kitten, Danielle Mendus, Jay Myers, Rezcat, SW Episode I Visual Dictionary.